I introduce Dustin and Wook. I met them in Baltimore on April 7, 2015. 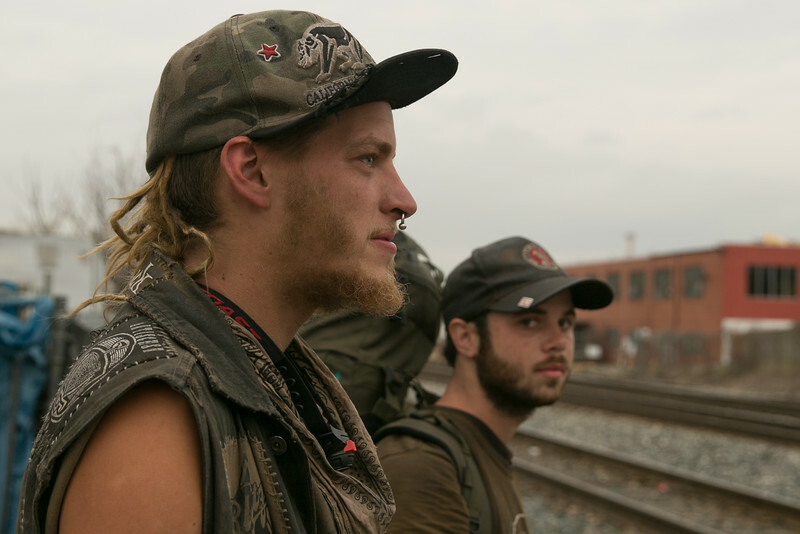 Train Travelers and Hobos are not an uncommon sight in Baltimore. Dustin is from Garden Grove, CA 22 years old, been riding trains for about 5 years. He is the only one in his family that travels by freight train. As I was driving Dustin and Wook back to their squat house, I asked Dustin to write down the information for me as I asked questions – Dustin wrote this on my paper to find later “Life’s about where you’re going, not about where you’ve been and it’s a hard road to follow and I don’t know where it ends.” Let me talk about that just for a second – generally train travelers are educated. I copied that directly from his note, Dustin is clearly educated because that is great English! Wook – From Burlington, VT, he is 24 and been riding trains for about 4 years. I generally ask all of the travelers how often they speak to family, I am always pleasantly surprised to hear they talk to family about once a week. Actually just before this shoot, I had to wait for Wook to hang up while he was talking to family. The dogs – I did not write names down, I normally do. I believe we are looking at Daisy (Dustin) and Bruiser (Wook). Please use the contact button below to tell me if I am wrong. One last note – I watched numerous people stop and give things to Dustin and Wook, I was a bit surprised that MOST of the “assistance” (Cash and Dog food) was aimed at the dogs, not the people. At the end of the photoshoot, a guy passed a $20 to Wook and made it clear it was for the dogs (not the humans). Very interesting.